Ever wondered who pays for the awesome game you just downloaded from the Google Play store for free? Or how does the mobile game developer get his costs back and manages to stay alive while you are playing for weeks and months without paying a single penny? As you may have guessed, most of mobile apps make their money through advertisements. The in-app banner and interstitial ads are one of the major sources of revenue for the app developer. Such ads are part of the ad networks. InMobi, one of the world’s largest independent mobile ad network, engaging 691 million consumers across 165 countries, has recently published some interesting insights into mobile app world. The InMobi App Insight Report summarizes unique trends and insights based on the analysis of over 7000 app promotion campaigns that ran on their network in Q2 2013. The report is particularly useful to app developers who rely heavily on trends, insights and data intelligence provided by ad networks. 5 Which site to target for maximum conversions? 7 Which ads work well on tablets? Over 50 Million app installs were delivered on the InMobi network in 2013 till the date the report was published. USA led the countries with nearly 34% of the apps downloaded and India was a distant second, with a little more than 9% of the total apps downloaded. 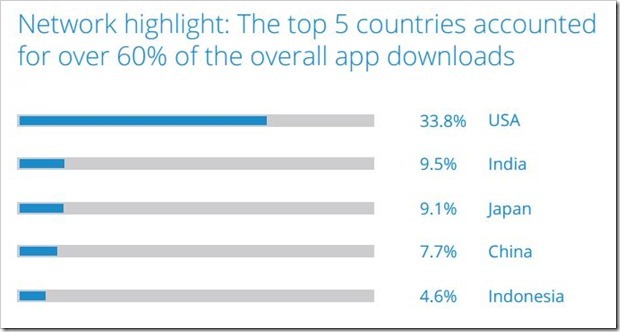 Not surprisingly, the top 5 countries accounted for over 60% of the overall app downloads. Japan, China and Indonesia lagged behind India in the top 5. But US is still the top country with 15.4% in terms of tablet usage on InMobi platform (with India nowhere in top 10) and the iPad covering a whopping 54% of total ad impressions. Of all the different app categories on the InMobi network, games represented the most downloaded category. Juniper Research’s report had predicted in the “Future App Store: Discovery, Monetization & Ecosystem Analysis 2013-2018,” report that gaming will fuel a sharp hike in app downloads – in 2017, over 160 billion apps will be downloaded globally onto consumer handsets and tablets. The trends observed on the InMobi network are in tandem with this prediction, with games as a category representing a strong 64% of the total apps downloaded through their network. Communication apps were a far 11.3% and telecom 6.8%. The ad which completely covers your mobile/tablet screen is an interstitial – they are the new love for users. Upto 25% click through and 10% conversions have been seen on interstitial ads on the InMobi network which should push app developers to ride this wave. The average conversion rates for interstitials across app categories ranged from 8% for comics to 5.6% for Health and Fitness. However, the good old banner ads continue to work well for a wide range of non-gaming apps on both iOS and Android with conversions of upto 3.5% for Software on Android and 2.6% for Weather on iOS. The bottom-line is a good mix of HD banner ads along with interstitials can help the app reach audiences on a wide range of devices and rotating ad formats can reduce ad fatigue, thus increasing ad engagement. Interestingly, on Android, the average conversions on interstitial ads are almost double (1.73% for iOS to 3.06% to Android) than that of other ad formats like Banner Ads, Expandables and Text Ads where iOS rules the roost. However, for Q2 2013, Apple manufactured 53.9% of total tablets compared to Samsung’s 28.4% and Amazon’s 4.1%. Which site to target for maximum conversions? Almost all kinds of sites delivered good downloads on games – suggesting that the audience for this category is diverse and widespread. Sports and health & fitness sites delivered maximum downloads for social apps. On the other hand, communication sites delivered the most downloads for entertainment apps. In tier 1 cities, most users will own a tablet by the end of 2013, generating 3x more download revenue than smartphones. For InMobi, one out of every three app promotion campaigns on the network also ran on tablets. The timeshare for tablets is a mindboggling 90 minutes compared to the 58 minutes for mobile and 50 minutes for desktops. Thus users are at least 3X more open to consuming ads on tablets compared to smartphones. Which ads work well on tablets? 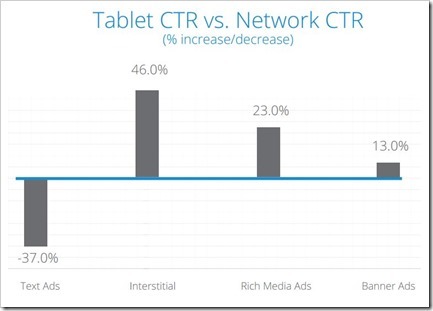 A quick comparison between tablet CTRs and average ad network CTRs reveal that text ads don’t work well on tablets. However, interstitial ads deliver solid results with almost 46% higher CTR for tablet campaigns. Indexed against the costs in the US, the research indicates that driving a download in most markets, especially in China, Japan and Korea is relatively cheaper in comparison to the US market , with the UK representing the most expensive markets and India the least expensive. China is the new US. According to IDC, in February 2013, China overtook the US to become the world’s largest smart device market, with 246 million devices (against the US 230 million) and accounted for 26.5% of all smartphone shipments last year. Concurrent with the growth in smart devices, mobile applications are also growing at an astronomical rate. In addition, the falling price of the iPhone and the increasingly capable low to mid-range Android handsets now available have further propelled this growth. Tablet without Internet, is it of any value? India becomes largest Mobile Advertising impressions market in Asia Pacific! InMobi survey reveals High Mobile Ad Engagement among Youth – Really?